For the past six months, with one of us being off work and on parental leave, after the rent and car insurance come out there isn’t much left for the first two weeks of the month. I spent what little was leftover on clothes to wear to job interviews and a cute outfit for the baby, and why can’t I stop buying cute outfits for the baby? He’s like a damp, squirmy doll. One that never stops eating. The kid lives for food – convulses for it, even – so maybe the outfits are a kind of reward for fitting in with the rest of us around here? Anyway, we’re in for a week or two of pantry meals. 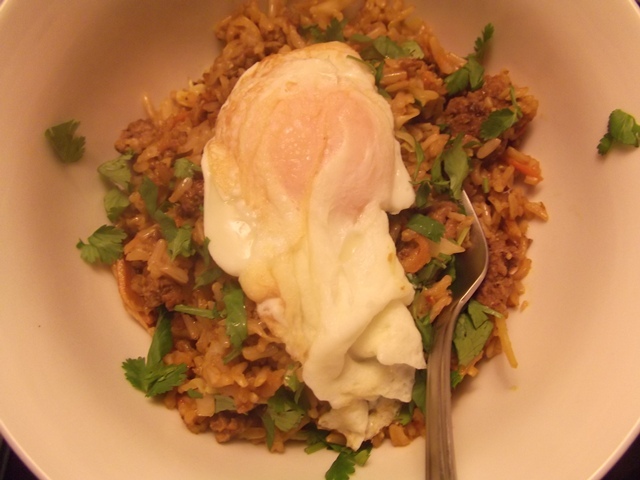 One that we eat frequently during times like these is nasi goreng, a spicy Dutch/Indonesian fried rice dish I learned about the first time I went to meet Nick’s family. There’s a Dutch breakfast restaurant near us that serves nasi goreng wrapped in a pannekoek. The Dutch are into it. It was Nick’s and his sister’s birthday when he first brought me over, and he’d requested nasi goreng with beef for their special birthday meal. I wasn’t eating red meat at that point, so his mom made me a separate meal (Relationship tip: start out high-maintenance, especially with your in-laws!). I was grateful – “nasi,” as they called it, looked semi-unappealing due to the unusual and disgusting (to me) addition of fried bananas. 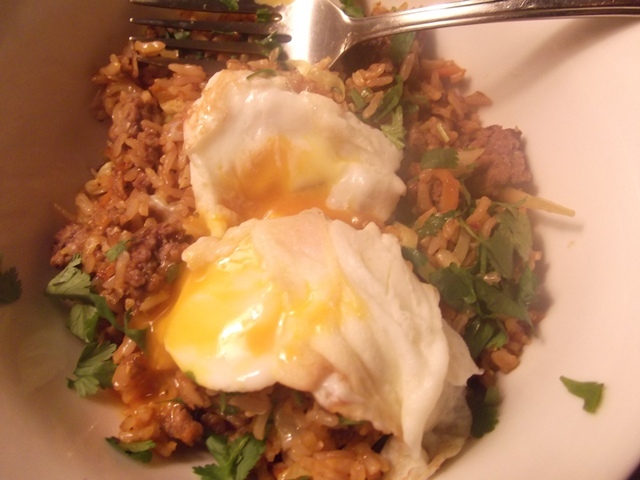 Nasi goreng is one of Nick’s favourite dishes, so fortunately I would encounter it again later after I had re-embraced red meat and understood that bananas aren’t mandatory. Side note: I am living proof that there is someone for everyone, even if he probably did something awful in a past life to deserve this. He doesn’t like bananas either. There are no actual unappealing parts to this dish, which I would come to learn (bananas aside). It’s salty and spicy and meaty, and there is so much garlic in it (I use nine cloves, but you can use less if garlic isn’t its own food group at your house). It’s especially good after Christmas or Easter dinner when you end up with a lot of leftover ham – a little diced ham goes a long way in this. If you have a lot of leftover chicken, dice that up instead of the ground meat. Add shrimp if you’ve got it. Make it vegetarian with smoked tofu and a few handfuls of frozen peas. This is best if you have a lot of leftover rice, but more often than not I end up making rice fresh due to my having forgotten to plan ahead. We use brown rice, but you can use whatever you want – three to four cups of cooked rice is about what you’ll need. And if you don’t have the ingredients I have listed below, substitute freely – soy sauce and sugar for the ketjap manis, sriracha for the sambal oelek. In a medium heavy-bottomed pan with a tight-fitting lid, over medium-high heat, bring rice and vegetable stock to a boil. Reduce heat to low, cover, and cook for 45 to 50 minutes. Set aside and allow to cool completely, which will take between two and four hours. In a large pan over medium-high heat, sauté garlic in oil until it is golden and crispy but not burned (two to three minutes – any longer and it will become too bitter). 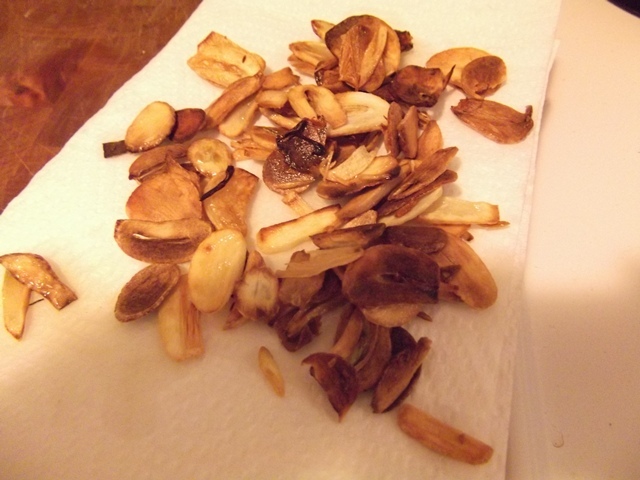 Remove garlic from pan with a slotted spoon, and drain garlic on a plate lined with paper towel. Set aside. In a blender or food processor, purée the shallot with the sambal oelek, ketjap manis, fish sauce, sesame oil, lime juice, and cumin. Set aside. Add ground beef to the now garlic-infused cooking oil in your hot pan. Continue cooking over medium-high heat until meat has browned and is cooked through. Add cooked rice, shredded carrot, and cabbage. Pour shallot mixture over pan contents and stir to coat. Cook an additional three to five minutes. Stir the crispy garlic into the rice. Taste, adjusting seasonings with salt and pepper to taste. Serve hot, topped with a sprinkle of cilantro, some scallions, and an egg fried over-easy, so that the yolk is still runny. Nick always adds more sambal oelek, and then apologizes as he douses the whole thing in Maggi sauce. *I find sambal oelek hotter than our usual hot sauces, so tread lightly if you’re spice-sensitive. If you don’t have sambal oelek, Chinese chili garlic paste will work, and so will Sriracha (which goes with everything). **If you don’t have or can’t find ketjap manis (also called kecap manis), use two tablespoons soy sauce with one tablespoon brown sugar. You can find ketjap manis as Asian grocers or Southeast Asian specialty markets – I got a huge bottle for less than three dollars at Thuan Phat Supermarket on Broadway and Prince Edward in Vancouver (though I hadn’t had much luck finding it at T&T). You can also find it online. < Previous Picking a winner. Next > A maple-scented pudding and a quiet moment alone. you could cook for me anyday. sounds delicious! Have you ever put shrimp chips on top? They are good sometimes if they aren’t too shrimpy-flavoured. Oooh! I’m going to try that next time. Do you crumble them, or just throw them on there whole? Fried bananas though … I just don’t know. So very, very yummy looking. I make a chickpea and tomato dish with fried eggs on top (runny yolks!) that kind of reminds me of this, I’m wondering if plantains would be alright because they aren’t quite as sweet. Plantains! Yes! I hadn’t thought of them, but that could be a workaround. Are you going to post the tomato-chickpea-rice recipe? I have tomatoes and chickpeas and rice! This is a childhood favourite for me too! I still make it but with ground pork. i like to eat it with Atjar tjampoer (pickled spicey beansprouts.). Thanks for sharing! I just wanted to say that I make this all the time after find your recipe. So good! My kids love it too (I dial down the chili a fair bit). Thx for this! Thank you! I’m so glad you like it – it’s a favourite around here too! Another winner! I LOVE this dish, its now a weekly staple in our house! I make it with a full head of broccoli, and with ground moose, since my husband is a hunter. Last week when I made it, I didn’t have any ground meat, so I fried up some bacon and added that. I love how versatile this recipe is! Win! 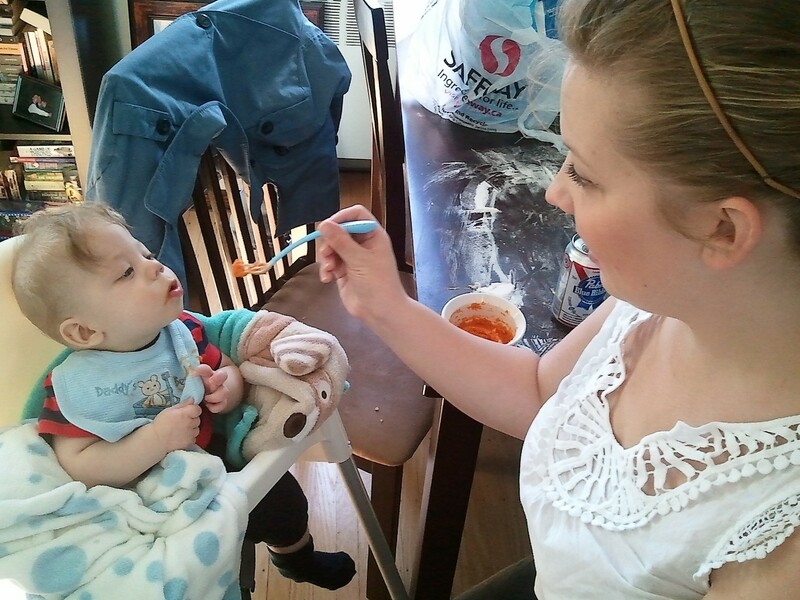 The toddler gobbles it up too! I’m so glad you like it! This is one of our regulars – it’s GREAT with moose (we usually use venison!). And anything a toddler will eat – bonus! New rule: bubble waffles are a surprise and not a destination to be discussed because we’re three @bubblewafflecafe locations and a SkyTrain journey from where we started and there have been tears.